Carry your stuff around like a Starfleet cadet! This Star Trek Lt. 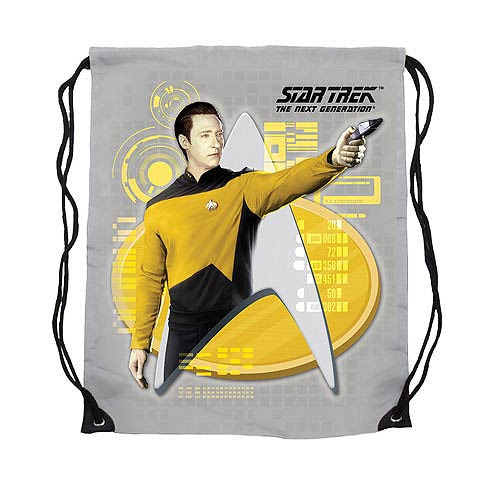 Commander Data Yellow Cinch Bag has been made from durable polyester with a heat transfer print. Reinforced bottom PU corners with a grommet for the straps increases the durability of the bag, so it is still only intended for light use, but it's perfect for storing your phaser or communicator! Measuring 17-inches tall x 13-inches wide, this awesome cinch bag features a cool graphic of Lt. Commander Data in his Starfleet uniform, phaser at the ready and standing in front of a Star Trek: The Next Generation themed background. Ages 8 and up.